I came up with the idea to challenge myself to come up with 100 blog post ideas in 30 minutes after I misunderstood the title a post I stumbled across called: How to Come Up With 100 Blog Post Ideas in 30 Minutes. I’m not sure if it was intentional or not, but I clicked in to that post thinking that they would show me how they had come up with 100 ideas in 30 minutes. Instead, it was a video showing me the tools that he used (for 30 minutes, I assume) that he claimed help him generate “about” 100 ideas. I have to admit, this was one of those moments when a clickbaity headline really let me down. I was looking for some documentation, for some guidance as to how he had created so many post ideas so quickly, and instead was given a vague idea on someone’s creative process. But, where there is disappointment, there is opportunity, right? I realized that if I were so excited to see something like that, why wouldn’t others be too? Why can’t I try to create that many ideas, in that time constraint, while also documenting the process and showing everyone the results? 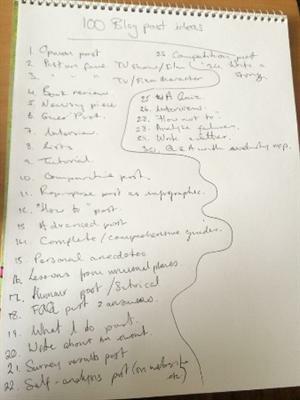 Here’s what happened when I challenged myself to create 100 blog post ideas in 30 minutes. 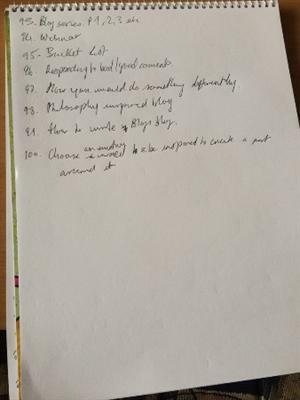 I don’t know if people will consider this “cheating” or not, but I really didn’t think I could generate 100 blog ideas without at least 15 minutes on the internet browsing and getting my brain ready. I looked through my previous blog posts (it seemed silly not to consider the ideas I had already come up with) and I looked at similar lists that have been already created. I admit, I was also glad that I couldn’t find anyone who had challenged themselves to create such an extensive list in a small amount of time. Some are very specific, and others are very general. My list was likely going to be a bit of both. After I did my research, I closed my laptop. Like I said, I didn’t want to copy any one list – I wanted to see if I could create my own. 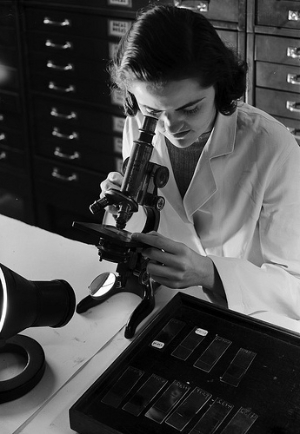 The research is specifically to get my head in the right place and to get me inspired. 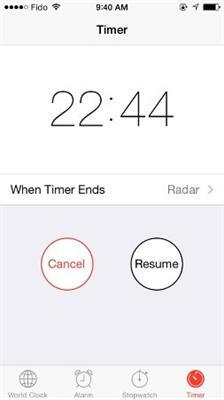 I then got my phone and set the timer to 30 minutes. Then I grabbed a sketch pad and pen. I like sketch pads best for brainstorming because you can get as messy as you want as you race to scribble down anything and everything. Plus, you can get them super cheap in any dollar store. I then titled my work (like the good student that I am). I started off by writing furiously. As you can see by my messy chicken scratch, I was a little panicked as I wrote. I didn’t think my brain could physically work that fast. Please note: I paused the timer when I wanted to take a photo & screenshot of the progress I was making during the challenge . If I didn’t, the results wouldn’t have been accurate. 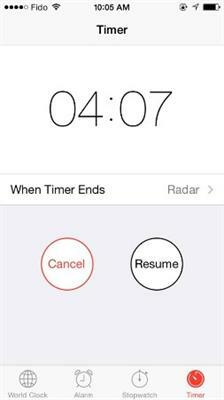 I started the timer again straight away! Promise. After 25 minutes and 53 seconds I had hit 100 blog post ideas. When the timer ran out I had 109 blog ideas written down. As you will see, after I tidied and typed, there were actually only 105 ideas. (I say only, but you know what I mean). It turned out I had repeated myself a few times, ideas were very similar to other ones, or they just didn’t make any sense when I read over them. Pressure can do weird things to your brain. Opinion Post: I love that this was the first thing I wrote, as I’m known to be quite opinionated so it’s quite apt. Obviously, this type of post is your very subjective opinion on something, and should always remind the readers that this is the case. Post Connected with Favorite TV Show/Film: I just wrote a post titled “What A Game of Thrones Can Teach Us About Content Marketing” so this is what came to mind while I wrote this idea. Making connections between TV/Film isn’t that hard if you look closely enough. Book Review: If you read a lot of books related to your industry, then this is perfect. People want to know if a book like this is worthwhile or not, so do share! Newsy Piece: Obviously, if something is in the news that’s related to your industry, covering it will make you appear in the know and people will want to follow you to get these kinds of updates. Lists: Lists are a really easy way for people to digest information, so they’re really popular and you can use this idea over and over with different topics. Comparative Post: Comparative posts are great. They’re super helpful for consumers in the decision making process. I really liked this one by OKSocial if you’d like to check out an example: Should You Blog, Vlog or Podcast? Re-purpose post: If you have a post that was quite popular, why not re-purpose it into an infographic or slideshare? You know it’s good already, so you might as well get the most out of it by appealing to all different types of readers! 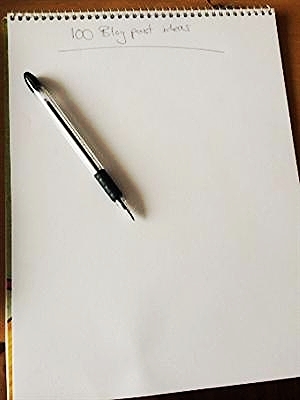 Advanced Post: How tos are for beginners, but if there’s something you’re really good at, don’t forget that there are people who are looking to get to that standard too who’d be interested in what you have to say! Complete/Comprehensive Post: These are really popular as they act as a “one stop shop” on a specific topic. 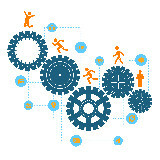 “What I do” post: This is different than a “how to” post in that you inject what you personally do. This has been popularized with the “Get Ready With Me” Youtube videos that have been dominating beauty/fashion bloggers channels. Self-Analysis Post: Self-analysis is hard, but it sometimes reveals a lot of lessons that you might otherwise not notice. Interview Reverse Psychology Post: Oops, I said interview twice. Anyways, reverse psychology posts are posts that work on your fears. They’re super effective because people want to read them and make sure they’re not doing anything wrong. For example, Forbes’ 7 Ways To Fail A Job Interview. Analyse Failures: Didn’t do too well? Use this as a lesson for others, they’ll thank you for it. Write A Letter: Open letters were everywhere after Sinéad ó Connor wrote one to Miley Cyrus. They’re a really effective way of addressing someone that you might not actually get to every talk with. Be Inspired by Something That’s Going Viral: I recently wrote 5 Lessons Courtesy of the Ice Bucket Challenge because I just couldn’t ignore the fact that it was everywhere. People are interested in viral (that’s why it’s viral) so don’t be afraid to tap into that. Three Wishes: If you could have three wishes, what would they be? You can make this more specific if you want, for example “3 Wishes For My Family”, “3 Wishes For the Future”, “Three Things I wish I could UN-see”. How to Start … : Different than how to’s because it’s about the beginning of a process. Best/Worst Advice: This can be about advice you’ve been given yourself, or advice you’ve commonly heard being given to others. Create A Challenge: Like this one! Perspective Blog: Take an original perspective. What about your experience is different than others’ experiences? Your gender? Class? Race? These are important perspectives that people can relate to. For example, Being a Black Female Comic. 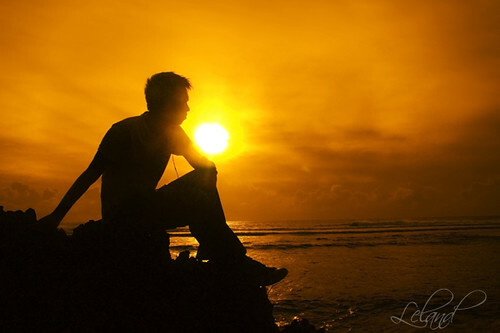 Opposition Post: Take a direct stand opposing something. This isn’t simply commentary, this is opposition so be prepared to take on a strong stance that you believe in. Favorite Tools: Everyone wants to know what tools you use to make your life easier, so share the love! Creative Posts: This is pretty general and incorporates a lot of ideas, but I think it’s important to remember that when you’re writing a blog post, the possibilities are endless. Click Bait: Click bait posts are headlines that purposefully don’t tell you the full story, making you curious enough to click into it and read the post. You have to be careful with click bait posts, because if it doesn’t deliver, you’ll just have angry/disappointed readers (like I was with the first post). Post on Blog Comments: Do you get a lot of comments? Why not write about how you deal with bad ones? Which ones you find constructive and which are you favorite? “What My Old Job Has Taught Me About Life…”: I used to be a teacher, and my experience in the front of 30 students for 3 years taught me a lot of valuable lessons. What lessons have informed your current career? Workload Management: I do a million things a day, but I’m hyper organized and I like to share my organizational tips with other people. If you have advice on managing your workload, share it! Jobs/Roles: People are always curious what I do for a living, so I thought it would actually make a nice blog post. If you also get people asking what you do a lot, why not write a post about it? CV/Portfolio: This is the same kind of curiosity that comes with the “Jobs/Roles” posts, where people just want to see what you’ve done and how they can relate, compare, or emulate your career path. Dictionary: Are there lots of new terms related to your industry? Make it easy for newbies by making a dictionary for them! Customer Appreciation: Put a spotlight on one of your favorite customers and write all about them and your relationship with them. This is a great way to humaise your business and show your customers that you really do care! Common Mistakes: An example of this can be seen by The Daily Mail Online, “How you have been tying your shoelaces the wrong way all these years“. Blog Series: If a topic is huge and can’t fit in to one blog post: Create a series with a few parts in it. The first part should start with the more basic information and the last with the more advanced information. Philosophy Informed Blog: Infuse your blog posts with some philosophy. The post can be based on the philosophy or you can use a philosophy that supports your point of view. Life Hacks: Tips and tricks are always great. Graphs: Don’t feel up to the challenge of making an infographic? Thanks to SmartArt in Word applications, you can make graphs right from the comfort of Word. It was really nerve wrecking, I have to admit. But it was that adrenaline which actually helped me create so many ideas in such a short space of time! 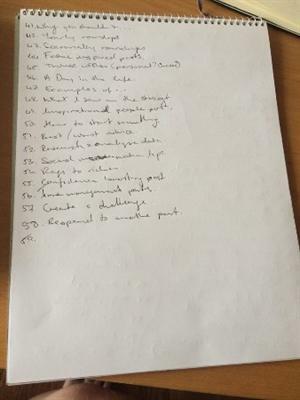 There are certain posts that I’ve obviously tried and tested already, but having them written down will remind me that I can recycle these ideas with different topics. I also came up with some really interesting ideas that I never thought about before. 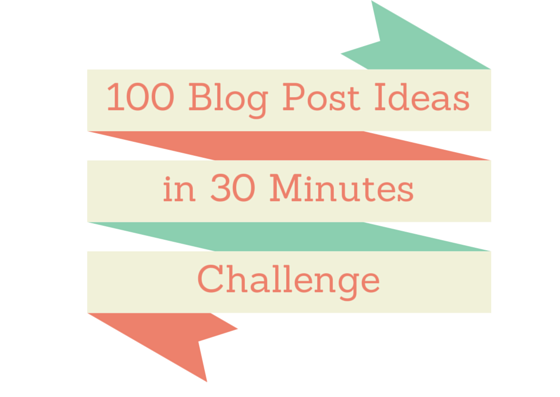 If you’ve taken the 100 Blog Post Ideas in 30 Minutes challenge, please don’t hesitate to share the results! I’ve had a few requests for an update on this blog challenge, so here it is! Posts that I have yet to schedule or write. As you can see from the graph, about 50% of the ideas have yet to be used. Of course, this doesn’t mean that I don’t intend to write on these topics, only that I haven’t gotten around to it yet! 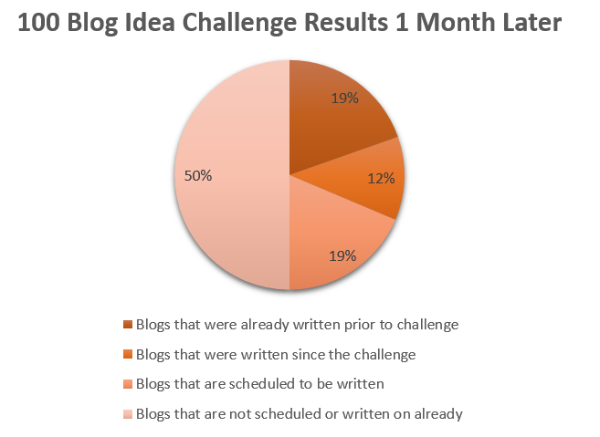 For me, the results demonstrate a huge success: The month following this challenge I was never stuck for ideas and my editorial schedule is planned all the way up to December now. Don’t forget to let me know if you’ve tried the challenge for yourself! Thanks for reading! 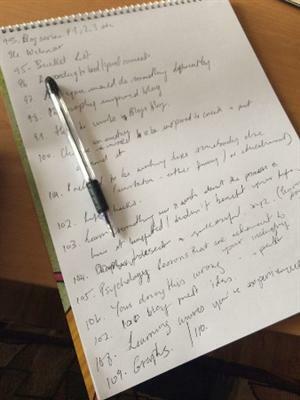 I took your challenge and got 108 post ideas – I didn’t do the research bit first and I haven’t read your ideas yet – I’m about to go and do that. I would not have thought I could do this, it was a fantastic exercise! Thank you so much. (I might even right a post about it which would make 109 but not technically within the half hour time frame. I still haven’t typed up my list so I haven’t added it to my post but I did get a post up! http://purfylle.blogspot.com.au/2014/09/challenge-accepted-fill-your-editorial.html Thanks again Sarah. I had that google comments thing on for half a day – it’s gone now. Sorry about that! I’lll let you know when I get my list up – it’s very sewing project orientated. Thanks for coming to visit! Hi Sarah, I love this idea. I often think that my brain works best under pressure, so I think I will be taking this challenge myself and seeing what I can do with it! I’ll be sure to let you know how it goes! Awesome, I look forward to seeing it! Adrenaline does wonders for creativity! Great Idea. Two question. How many of these posts do you think will really write? How many of these do you think will become a series? Steven! What a great idea! I went all data nerdy on this and actually counted up how many I’ve written on already, how many I’ve scheduled to write (Schedule is finished up until Nov), how many I’ve written on since I created the blog about a month ago and then how many aren’t scheduled or written currently – and uhm… I made a graph. I’m going to actually update this post with this information, but I wanted to share it with you personally since you’re the one who inspired me to write it! I love the fact that you went all nerdy. I like to do that too. Good luck with the rest of the posts. I took your advice in the post and I have a list of about 80 potential blog posts. I guess I will be busy until sometime in 2023. Oooooh great idea! I really need to try this! It sounds so doable when you read the title and then you start to think about it and the challenge sinks in…. But it would be a fantastic exercise!! Thank you for sharing! Haha, I know! 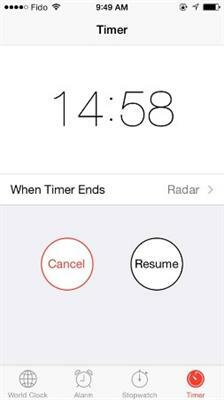 When you do the math, you’ll find that the challenge actually gives you 18 seconds to come up with a blog post idea. It’s really tough – but soo worth it! The ideas kept me going for months! great idea … Working under pressure . Let see if I can take the challenge or not . Very clean Sarah, A lot of these strategies are regulars with our marketing techniques. Thanks for sharing and keep up the great work! This is amazing. your way of explanation is so simple and easy to understand. keep up the good work mate!